Yesterday Donna posted about a flurry of activity she's whipping up to finish Marilinda, her current Personal Sock project, by its due date. It reminded me of my own current Personal Sock Club installment - languishing with only about 13cm of the first sock completed. My Sock Club schedule for 2009 is not too hurried as I've set myself only 7 pairs for the year, and I have about another month to finish these. I like the rather retro, sometimes austere style of many of Nancy Bush's socks (these are Country Socks from 'Folk Socks'), but this time I think I might have erred too much on the side of plain-ness to inspire me feel passionately about them. Still, they will be useful. 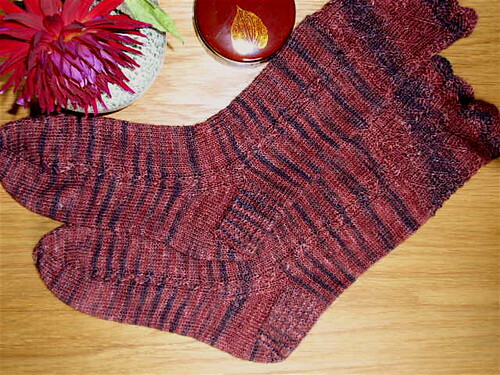 I've also recently read Jane's blog post about her current sock knitting - and her Ishbel. Her flurry of sock knitting is more like a whirlwind, with a number of socks cast on to test different sock knitting techniques she's teaching. 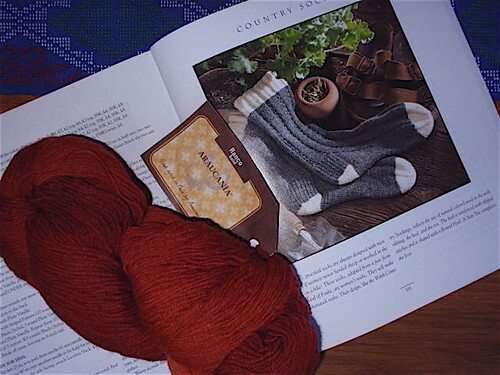 She makes some interesting comparisons in passing of Cookie A's and Wendy Johnson's recently published books and sock styles and has (almost) convinced me to try toe-up socks. Jane's socks mostly remind me of spring. Even when she's knitting them in the depths of an English winter the colours are fresh and the patterns joyous. And this evening I looked at the classes for the 2009 Sock Summit that's being held in Portland, Oregon in the USA in August. Nancy Bush herself (my hero) is teaching several classes - one on traditional Estonian socks, and another on adapting vintage patterns. Wouldn't that be fun? Still, I'm not feeling too envious because I'm planning to attend the Byron Bay Writers' Festival at just the same time as the Sock Summit. I'm sure I'll find some of my local heroes there - even if they're not knitters. So, I'm hoping all this sock stimulation will inspire me to resume my Country Socks. Maybe I'll even get them finished before the self-imposed deadline. 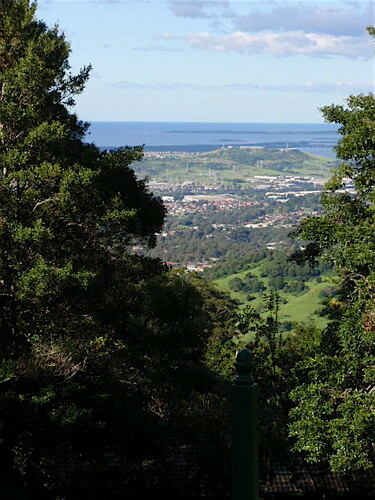 I've just spent a wonderful weekend at Knitting Camp at Mt Keira - just outside Wollongong. When I told people about my plans to attend, mostly they burst into spontaneous laughter - as much at the thought that I would voluntarily go anywhere with 'camp' in the title as at the notion of knitters getting together for a weekend. Knitters immediately understand the attraction of spending a weekend with other knitters; non-knitters seem mystified by the idea. I spent almost all the daylight hours of the camp sitting in the sun with this stunning view in front of me; knitting. The greatest pleasure, as a number of knitters remarked, was knitting to the end of the row, beginning to think 'I really must go and....', and then realising 'I don't have to do anything other than knitting'. Such a pleasure. There were other great pleasures: glancing down at the array of handknitted socks on feet propped on a beautiful low stone wall; watching the extraordinary knitting speed of those participating in the beanie speed-knitting competition; being able to ask endless questions about yarns and patterns; planning future projects; meeting fellow knit-bloggers for the first time; being part of the winning (yes, winning) team for the trivia quiz. (As an aside - I like to think of myself as non-competitive, but by the second round of the trivia quiz, when it was clear we had a chance of winning, our whole team developed a very keen competitive edge). 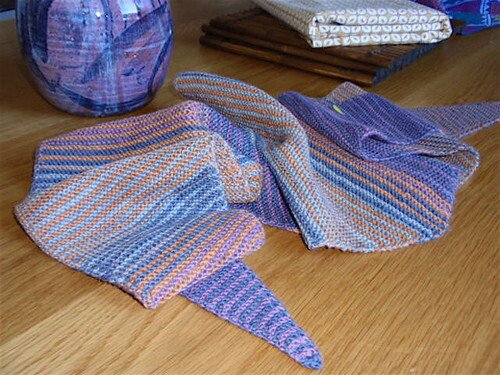 My major knitting achievement was finishing my 'Baktus' scarf - a very simple garter-stitch project in two-row stripes that shows off the not so subtle colour variations in the yarn (Grignasco Solid Print) to perfection. I marveled at the generosity and energy of Christine, Kerry and Rae from CRK Daisy Designs who organised the camp. They managed a perfect combination of organisation and informality - a rare achievement. 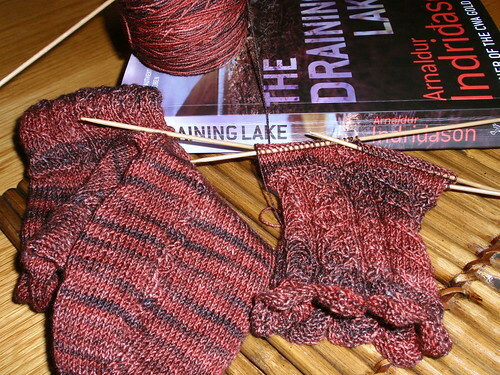 I loved the 'knitting' component of knitting camp, and coped better than I had expected with the 'camp' component. And I spent the whole weekend not thinking about any of the things I would otherwise have been obsessing about. A great gift. Others have already blogged about the event. They're clearly better able to multi-task than I am. 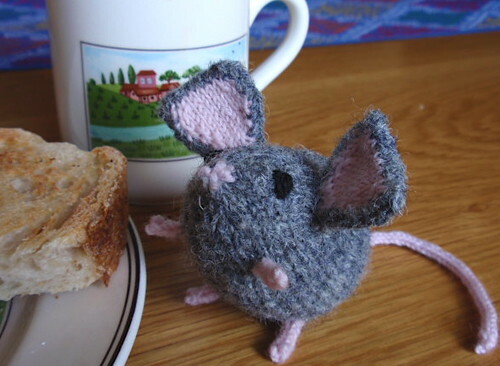 They've taken photos as well as knitting and chatting and eating and drinking. I'm sure there must be many psychological theories that try to explain the mental pattern-making we all engage in to make sense of our world. At one extreme, I guess this pattern-making results in elaborate conspiracy theories and hypotheses about the power of aliens in our world. My own mental pattern-making is at the mild end of the spectrum, and mostly exhibits itself in pleasurably observing the way apparently unrelated incidents come together to make patterns. I've had a bit of a Scandinavian pattern happening lately. (Immediately I wrote this sentence I felt rather self-conscious. Do people from the various countries that make up the entity I think of as 'Scandinavia' resent being lumped together under this label? I'm sufficiently aware of some of the cultural, historical and language differences between Denmark, Norway, Sweden, Finland and Iceland to feel some discomfort with this over-arching category. I'd be interested in any comments). 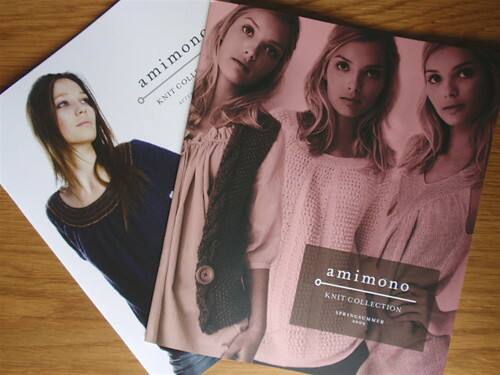 so I've purchased some of these patterns and am working up courage and energy to knit in the rather fine yarns they require. In the meantime I've been knitting from time to time on Baktus, a most pleasurable garter-stitch project that's a free, simple pattern from Strikkelise, a Norwegian knitter. I've blogged about my captivation by Swedish crime fiction, and , more recently, my pleasure in reading Icelandic author Ardaldur Idridason, so I'm often imaginatively engaged with Scandinavian landscapes. 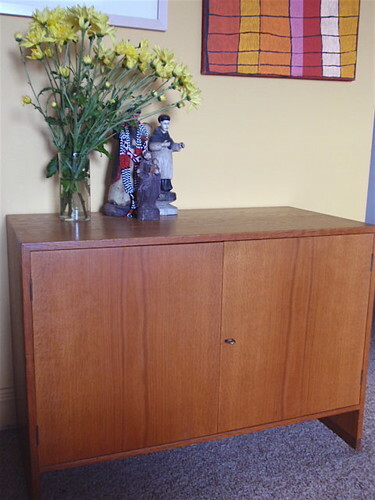 But I think the Scandinavian pattern really began about six months ago when I bought a small cabinet for my living room. It's a very simple cabinet by Danish designer Hans Wegner made in the 1960s for the Ry Mobler workshop in Denmark. It's made of oak and the interior is finished in beech. If one can fall in love with an object, I've fallen in love with my Danish cabinet. The dotee (my grand-daughter) turns two in early May. 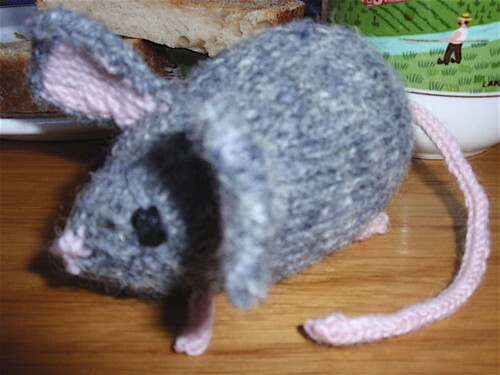 I've knitted a gift mouse for her birthday. The pattern is 'Mousie' by Ysolda Teague. So cute. 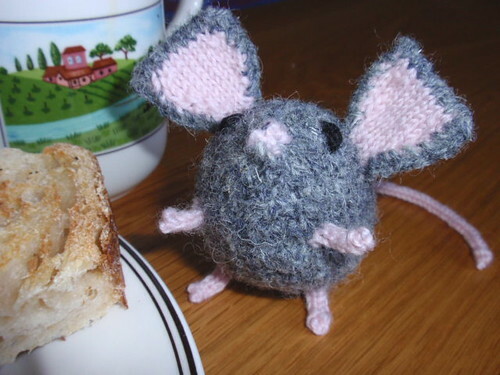 You start knitting with an i-cord at the tip of the tail and continue through to the nose, stuffing the body as you go along. The stitches for the legs and ears are picked up from the stuffed body. It's hard not to flinch as you poke your sticks into the poor wee thing! Some left-over scraps of Rowan Scottish Tweed 4 ply in grey were perfect for the main body. Surprisingly, despite having a small grand-daughter, I had no scraps of pink yarn and purchased some 4 ply pink wool from Lincraft - I've already lost the label. The dotee and her parents are currently in Mexico, so the mouse will be posted off this week. It's been a fun, if fiddly, project. The latest yarn delivery from my 2009 Personal Sock Club arrived today. It's Araucania Ranco Solid in variegated tones of rich brick red. Such a robust, solid yarn deserves an honest, traditional pattern, so I've decided to make Nancy Bush's Country Socks from her 1994 book 'Folk Socks' - but without the contrast toes, heels and bands. So... more Nancy Bush, more red socks, more traditional patterns. I'm describing this as developing a sock knitting style, rather than as being stuck in a rut. With most of my crafting activities over the years I've taken my pleasure from tweaking details and ringing the changes of a particular theme, rather than from being boldly innovative - what I've previously described as 'colouring inside the lines'. 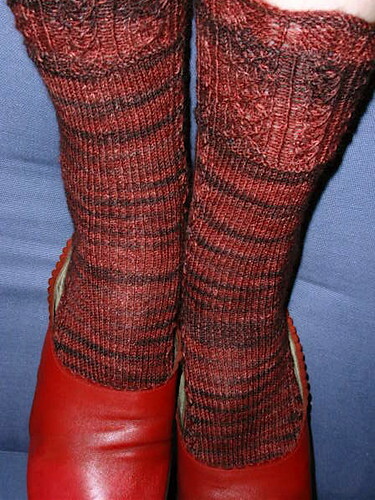 So, another pair of red socks and another Nancy Bush pattern allows me to explore a theme with variations. At long last I've finished my Traveler's Stockings. 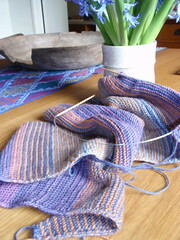 They seem to have taken an eternity to knit, though in reality, it's exactly 50 days since I cast on. However, fifty days is probably the knitting equivalent of an eternity for some of my speedier knitting friends. The next 'delivery' from my 2009 Personal Sock Club is due on Wednesday, and this is the sole reason I've been able to motivate myself to complete these socks. I've not enjoyed knitting them. 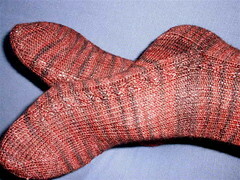 I used The Knittery Slim Sock which is a richly dyed yarn with an almost silky surface and good stitch definition. But it's thin. Very thin. Probably would have been better with 2mm needles than the 2.25s that I used. And because of the slipperiness of the rather tightly spun yarn, I had more dropped stitches than usual and a great ideal of practice in picking up and rescuing the dropped stitches. I'm also not sure I like the extent of colour variation in the yarn and the stripey effect. Particularly for the rather elaborate cuff of travelling stitches, I think a more solid coloured yarn that didn't distract from the busyness of the pattern would have been better. But there are positives. It's a beautiful pattern, written with Nancy Bush's usual clarity and published in 'Knitting on the Road'. I like the contrast of the fancy cuff with the simple sock body, and I think it's very cunning that the cuff is effectively a sampler of different travelling stitches. The socks fit me perfectly; the colour - though busy - is lovely as well as useful (and impossible to photograph accurately); and the good side of the slimness of the yarn is that the socks are very neat and not bulky. And the best thing about them is that they are finished. Several months ago I changed my work pattern from full-time to working four days a week. I'd been wanting to do this for some time, and the outcome has been every bit as wonderful as I'd hoped. Usually, I spend my non-weekend day off going out to do pleasurable things; visiting friends, leisurely shopping, going to the movies. But this week I stayed at home on my day off. Despite the wonderful, clear autumn weather I stayed inside and knitted and read...and really enjoyed myself. The next installment of my 2009 Personal Sock Club arrives on 14 April - only a week away. Before yesterday, I had only one of the socks from the last consignment of my personal club completed. 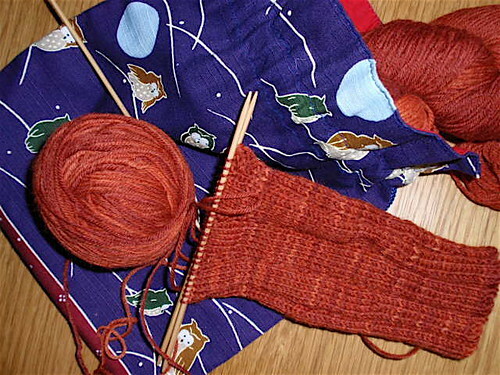 Nancy Bush's 'Traveler's Stocking' in The Knittery Slim Sock has been quite a challenge for me, and I'd allowed myself to be distracted by Ysolda Teague's Ishbel scarf. But yesterday I cast on for my second sock, and with daylight streaming through the window to illuminate the dark yarn, and increased familiarity with the pattern, I finished the rather elaborately patterned cuff on the second sock. With lots of Easter knitting time coming up, I think I'll be able to finish the socks before the manilla envelope with my next sock installment 'arrives'. I also managed to finish reading Arnaldur Indridason's 'The Draining Lake'. I've blogged before about my captivation by Swedish crime fiction, and this is a sideways move - Icelandic crime fiction! I'd had this author recommended to me, but this is the first of his novels I've read. It's great. It provides an insight into both modern day and Cold War era Iceland with its somewhat claustrophobic, gloomy view of life, and has a densely plotted, multi-thread narrative. Highly recommended. PS - I bought the book for $9.95 from the so-good no-name discount bookstore at the Railway Square end of the much-maligned Devonshire Street tunnel in Sydney. 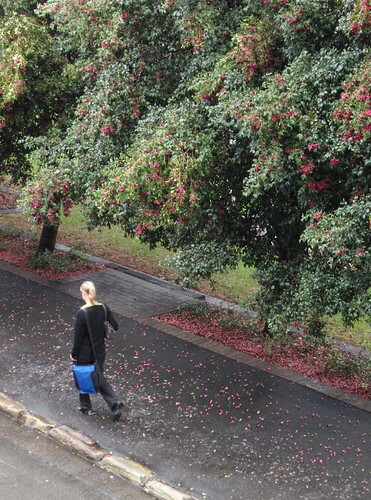 The lilly pilly trees outside my windows are heavy with fruit. It seems a shame that so much natural bounty should go to waste. A couple of years ago one of my neighbours collected the fruit and made jam, but I suspect the time and effort both in harvesting the fruit and making the jam might be rather onerous. Anyway, I don't eat jam. As an aside, this reminds me of a wonderful film by French director Agnes Varda called The Gleaners and I in which she quirkily examines people who live on 'gleanings' from what is left over or cast aside. Probably a lesson for our times, though interestingly, IMDb user comments summarise it as 'A great film maker examines the role of the artist in society'. Glean whatever meaning (or combination of meanings) that you wish. I grew up in a house with a large garden, and parents - my father in particular - who were keen gardeners. We had fruit trees (apples, pears, plums, peaches, cherries, figs, almonds, apricots, lemons, oranges) as well as a large vegetable garden that supplied all our needs, and those of many of our neighbours. My father disapproved of trees that weren't useful, and the decorative part of the garden was made up of roses, some flowering shrubs, and colourful, profuse displays of labour-intensive annuals. Poppies were his favourites, and I still think of him every time I see a bunch of poppies. Despite this beginning, I've voluntarily lived almost all my adult life in an apartment. For the last twenty-five years I've lived in an apartment that doesn't even have a balcony. 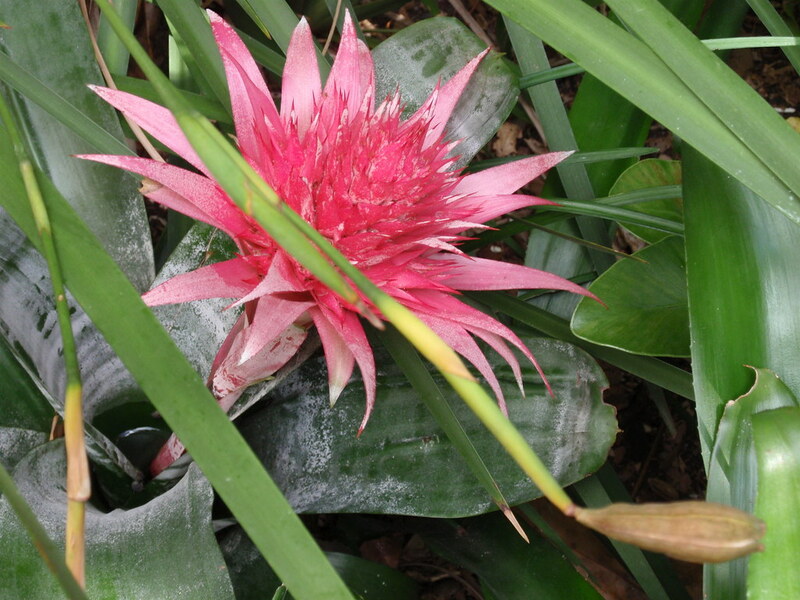 It's not that I don't like gardens - I do - public gardens or other people's gardens give me a great deal of pleasure. But I don't like the constant commitment of gardening. As a consequence, I'm very aware of and pleased by all the trees, shrubs, and other plantings that are in my daily life. At present the lilly pillys are a central part of this pleasure. I'm particularly fortunate that my apartment building has an internal courtyard garden that's lovingly tended by a team of volunteer resident gardeners. 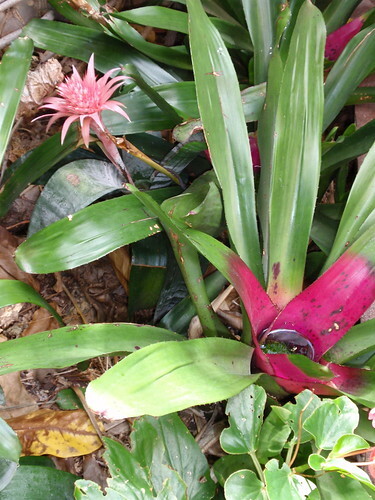 The garden's rather shady, but in the morning there's a patch of sun outside my apartment that they've planted with bright bromeliads, which continuously delight me. 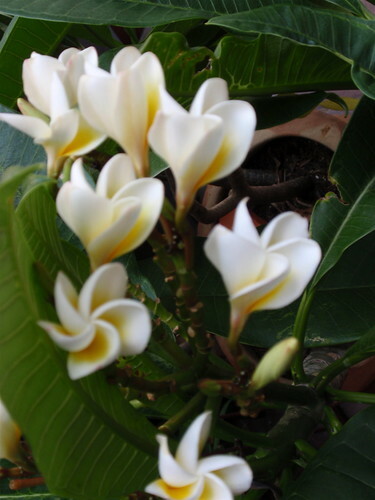 Another of my neighbours has her own courtyard, with profuse plantings and an ever-expanding frangipani tree. Each year she prunes it vigorously and the cuttings are 'struck' in pots in the courtyard. Perhaps another case of gleaning? Some of these are now quite large, and their distinctive fragrance and waxy white and gold colours are evocative of Sydney late summer evenings. I glean my delight in gardens from what's left behind of the fruits of others' gardening labour.